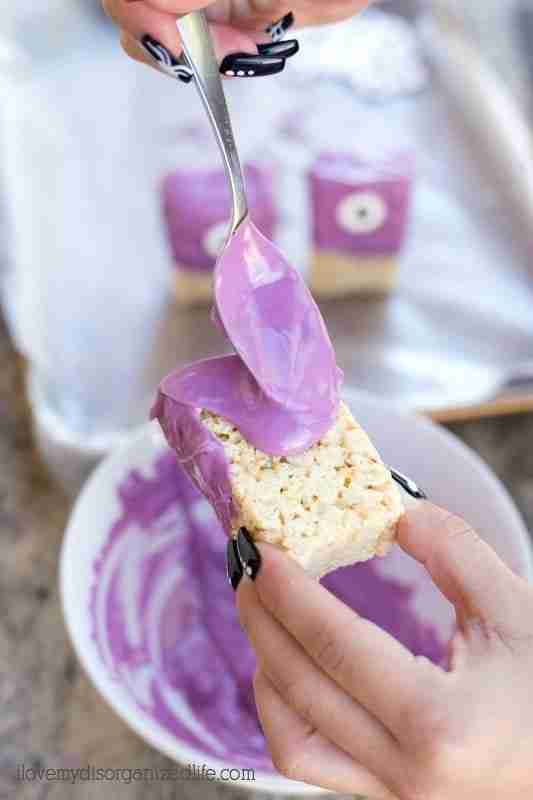 Purple People Eater Rice Krispies Treats are a quick and easy treat to make with the kids. Just a few simple ingredients/items is all you need! Holidays are always so much more fun when you made easy no-bake treats with the kids. 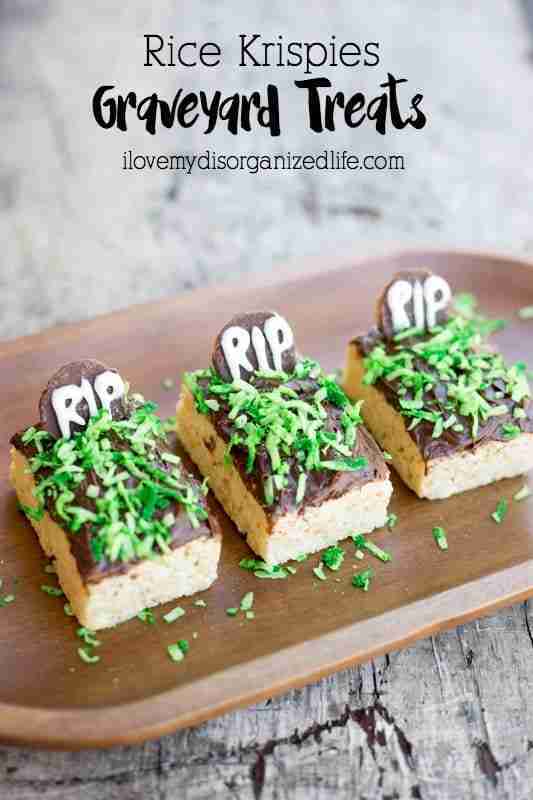 You may have seen the Rice Krispies Graveyard Treats my daughter and I recently made. They were so easy, and so fun. 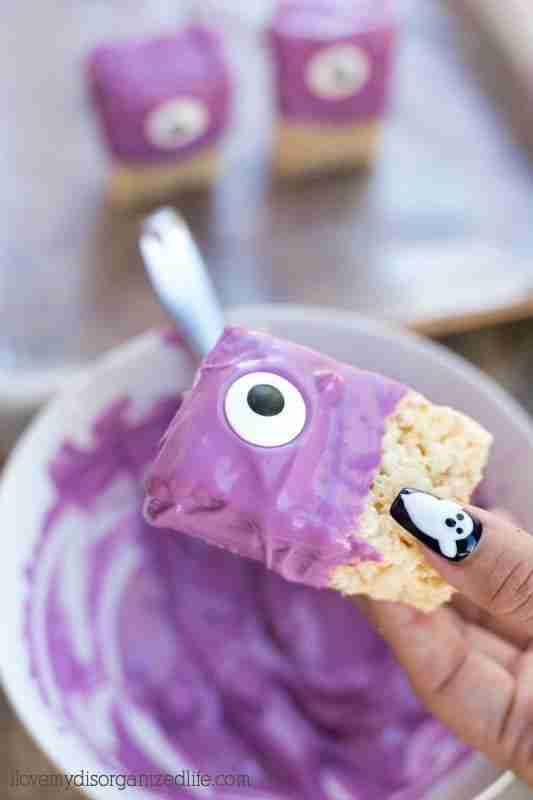 I think I love these Purple People Eater Rice Krispies Treats even better. 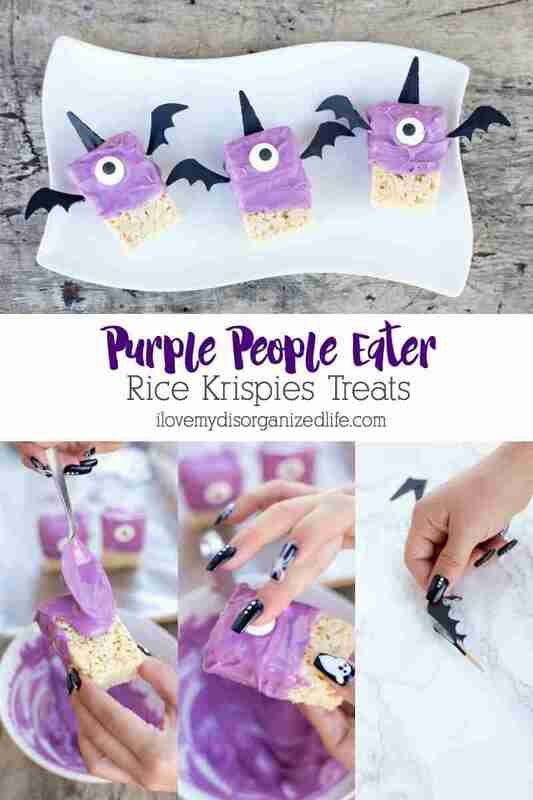 My daughter had seen some super cute monster Rice Krispies Treats on Pinterest, and I thought it would be fun to turn them into these purple people eaters. You remember the song, don’t you? I swear they only play it during Halloween. 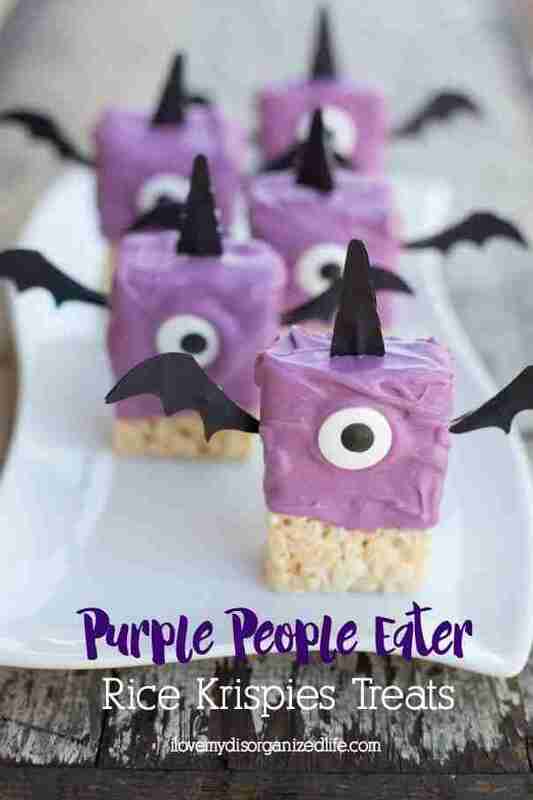 “It was a one-eyed one-horned flying purple people eater…” Well, now’s your chance to eat the people eater! 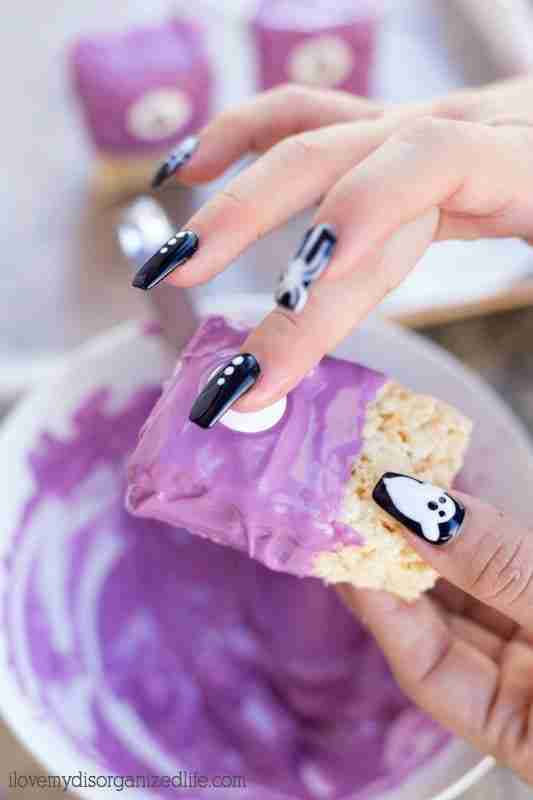 All you need to do is melt some lavender colored vanilla flavored candy melts and use it to frost mini Rice Krispies Treats. I picked up some large candy eyes in the baking section of my local grocery store and placed one on each treat before the candy hardened. I put them towards the top third of the treat in the center so it would look like one huge eye in the middle of the face. Next, I used my Cricut Explore Air 2 and 12×12 black cardstock to make wings and horns. I’ve already taken the work out for you, too. Simply click here for the template. Just use the duplicate button to add more wings and/or horns depending on how many treats you are making. You will need to keep in mind that you will need two horns (front and back) for each treat and four wings (fronts and backs of two wings) for each treat you are adding. To attach the wings and horns to my people eaters, I used half as many toothpicks as I had people eaters. 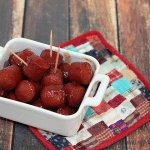 So, if you’re making ten treats, you need to break five toothpicks in half. Next, I added glue strips to the backs of two wings. You will be putting them back to back, so keep this in mind when adding your glue strips. Once you have added the glue, place one toothpick half in the center of one of the wings, about half way up. 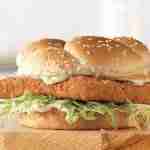 You need to be sure to leave enough of the toothpick showing at the bottom. You will use this to stick into your treat. Place the other half of the wing on top of the toothpick as shown. 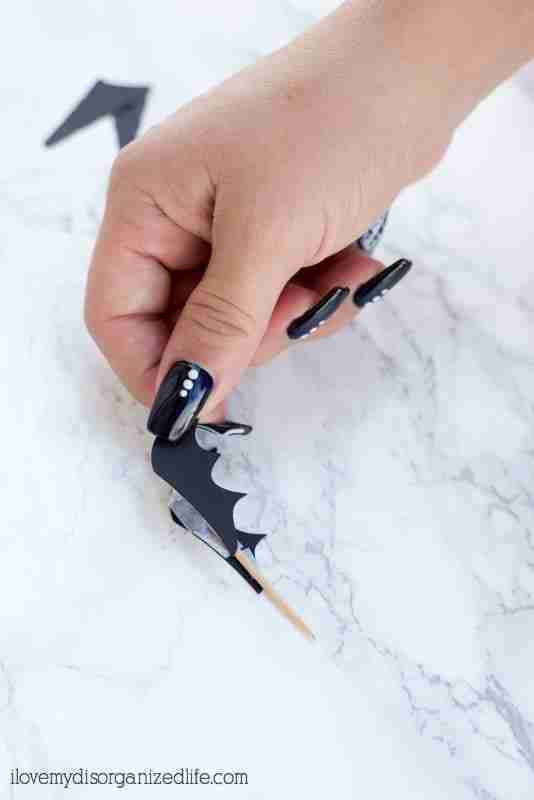 Press together so that both halves of the wing adhere to the toothpick and each other. Repeat this process with the remaining wings and all of the horns. 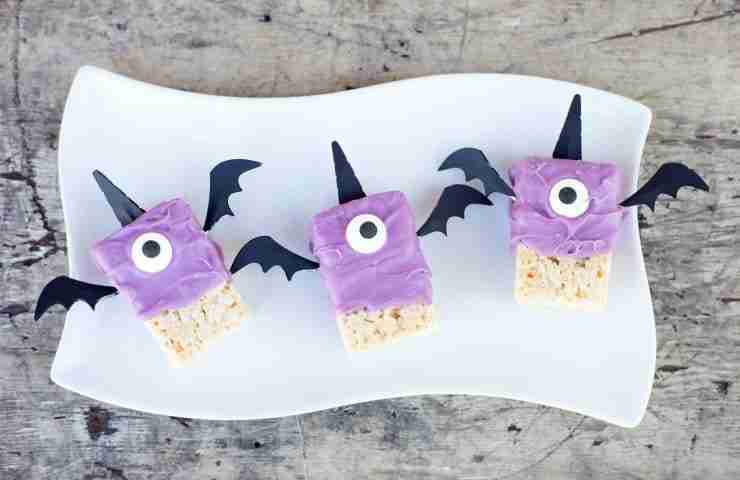 Once the candy melt coating is set on the treats, insert the toothpick side of one horn on top of a purple eaters head in the middle of the treat. Next, insert the wings the same way on either of it’s sides. I went in at a slight angle from the top. Repeat with your remaining treats. 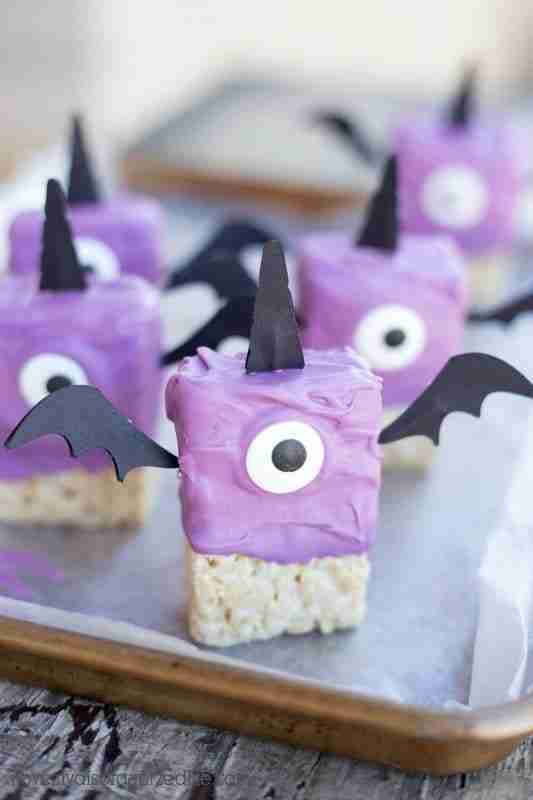 Purple People Eater Rice Krispies Treats are quick and easy to make with the kids. Just a few simple ingredients/items is all you need for these no-bake treats! 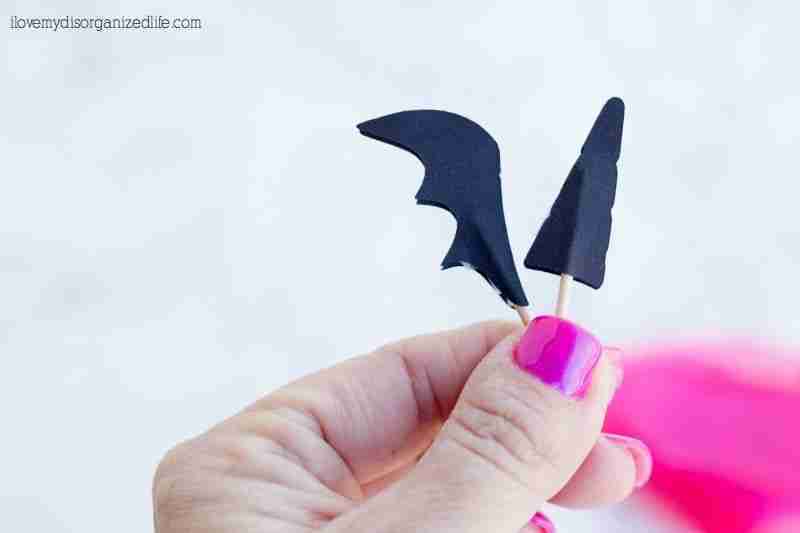 In Cricut Design Space, use my horns and wings template to cut out desired number of horns and wings, using the black card stock. *Don't forget to remove the horns and wings before eating!